Another in a continuation of posts (Silent Film Effect, Kabuki Drop) detailing some of the behind the scenes elements from our Gunch! production, today we’ll talk about how we build the set. We had four major set elements, from house left to right; Trash Mountain (another post), a 8’ wide x 12’ high wall, a 22’ wide x 18’ screen and a 36’ wide x 12 high wall with a set of 4’ doors in it. The two walls were shaped with gentle curves to create the rolling hills of U-Ville. 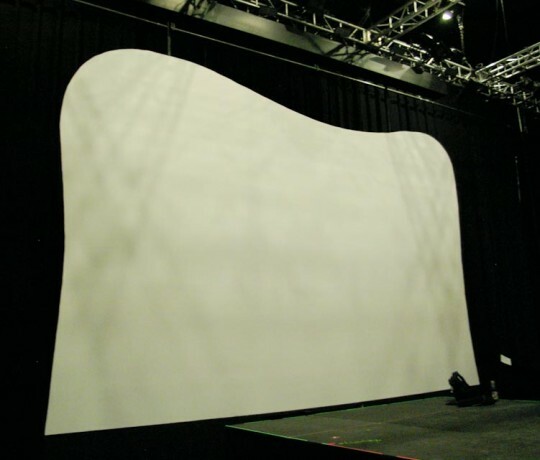 The screen was also cut out in a shape to match the projection shape. 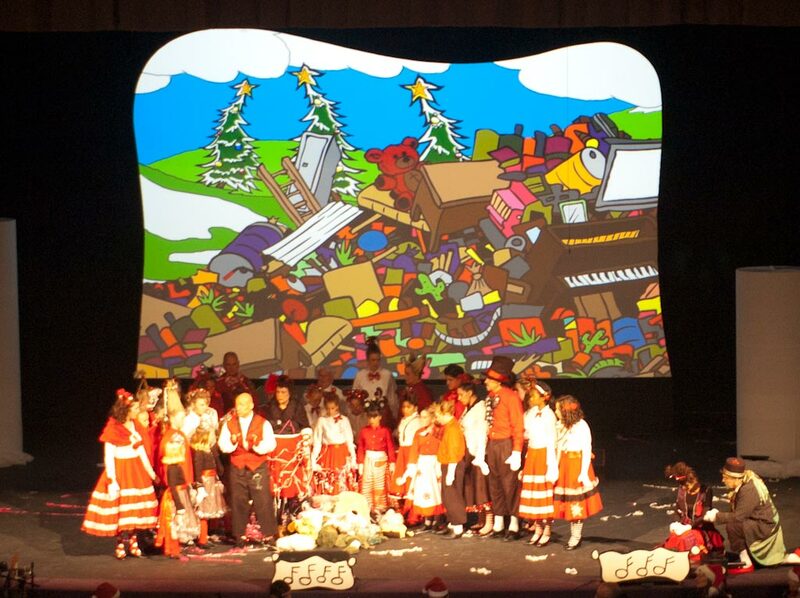 This shape was designed by our Communications Director, Ken Hammond, and added another whimsical element to the set. Here’s how we did it. Last year, we build two side “walls” out of a 1x4 frame and stretched fabric over it. It worked OK, but didn’t really give us the effect we were looking for. We had a number of challenges creating the gently rolling curves on top, and if anyone leaned against the back of the fabric (we hid a lot of props back there) during the show, you could clearly see it. They were also not terribly sturdy and made a huge mess when we had to size the fabric. I know it’s the way of making things in the theater, but we’re not a theater and I don’t have a theatrical background. I have a background in residential and commercial construction. 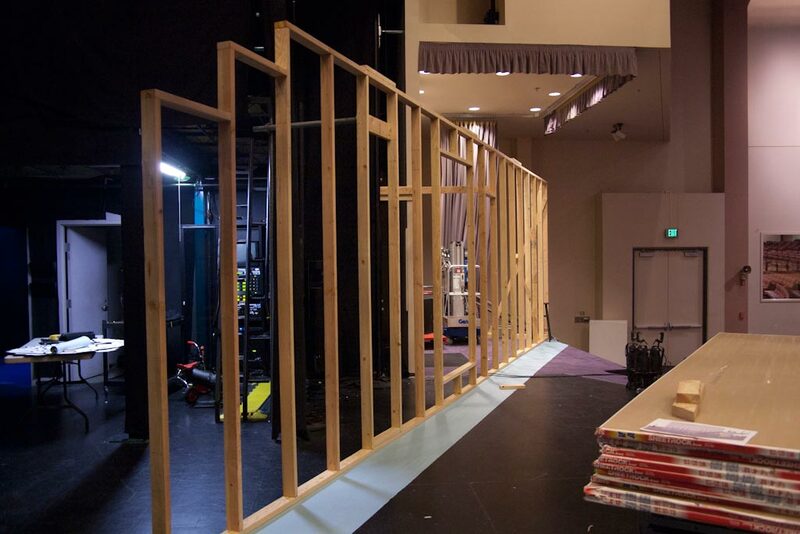 So this year, I build the set pieces out of what I know; studs and drywall. The framing was stepped to accomodate the ultimate shapeof the top of the wall. Again, we knew the wall would curve down at the end, so we build the framing to match. At it's highest point, the framing is 10'. We then stood 12' sheets of drywall up on end to give us the ability to shape the top without hitting framing. Because it needed to be 18' high, we joined studs with 2' mending plates. The cutout in the center is for access to the center stage structure.That may sound like heresy, but track with me for a moment. Last year, the fabric alone cost us more than $500. This year, all the studs and drywall for the three pieces (which is more square footage than last year by an additional 50%) cost us $543. Plus $20 for the Home Depot truck we rented. Last year, it took us a full 4 days to build both walls. This year, we had the framing done in about 6 hours--for all three pieces. On day two, we hung all the drywall in about another 5 hours, and then I spent about 4 hours (total) taping the seams. I happen to have a lot of experience taping drywall, so I was able to move quickly and get the seams taped in a way that required very little sanding. That little bit of sanding generated surprisingly little dust since we used Sheetrock’s new dust control joint compound followed by some painting and we were done. To create the shape on the top (and sides of the screen), we employed a few methods. 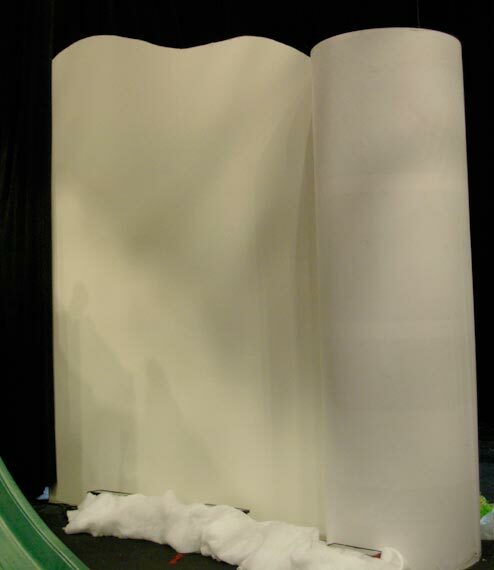 The long wall was cut with a spiral cutting tool (AKA RotoZip). I had one of my helpers track with me using a shop vac to control the dust. This worked OK, but controlling the tool was a bit challenging and we had some minor imperfections on the line. It was fine, but we figured we could do better. The short wall was cut by hand with a drywall saw. Isaiah cut that one, and it looked great, though it took him a little time. We uplit the two side walls with ColorBlasts (disguised with "snow"). Same lighting as the short wall. 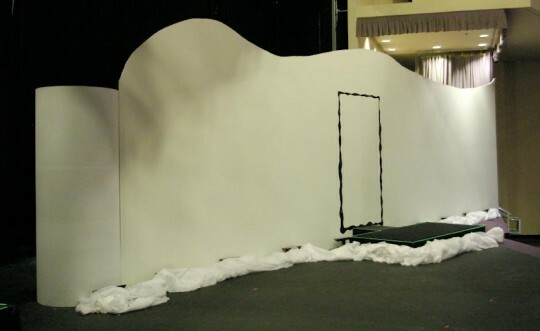 This wall has a 4' wide door in themiddle to create the silent film stage. All cut out and finished, the screen was cut exactly to match projection.We started cutting the screen by hand (after projecting the video on the wall with the mask in place--thank you Renewed Vision for the Mask Layer! ), but quickly realized it would take a long time. We considered the spiral tool, but were concerned that it would take off and create divots where we didn’t want them. Ken suggested using a jig saw. We put some packing tape on the sole to help it slide and avoid scuffing the drywall and went to work. And did it work! Todd, our Pastor of Weekends (and my boss) cut the entire screen out in about 30 minutes. And that includes the time moving SteelDeck around that was in the way of the lift. To finish it off, we painted the bottom of the screen (below the video) black and when the lights and video came up, it appeared to float in mid-air. It looked brilliant! All the walls were painted with drywall primer and Behr Ceiling Paint (flat). Each of the walls were anchored differently, depending on what was near them. The small wall was strapped to a nearby pipe holding up our lighting storage world, and braced back to lighting storage with a 1x. Being small, that was enough. The long wall had a angled brace on far stage left (where no one ever walked) that was anchored by sandbags and a concrete block. 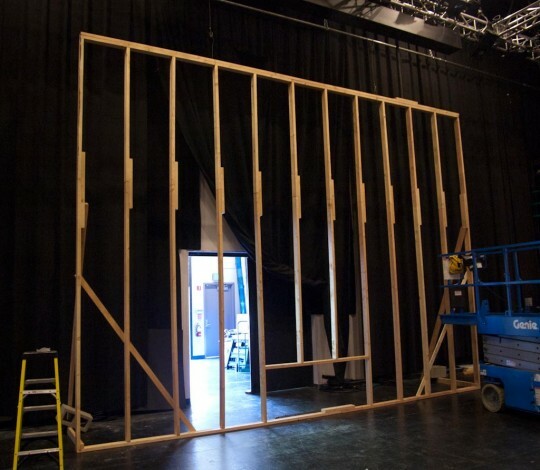 In the middle, I screwed a 1x8 to the building wall (behind the stage wall) and braced out using a 2x4. At the other end, we used a piece of 1 1/2” pipe anchored to the set wall with a floor flange and cheeseboroughed the other end to the pipe holding up the area formerly known as monitor world. Again, it was rock solid. Once this pipe went in, the wall wasn't moving.The big screen originally had angle braces on it, but we didn’t like how it impeded traffic flow behind the wall (we used it for a lot of entrances and exits). So we again anchored some 1x8 to the back wall of the stage and braced out to the wall with 2x4s. 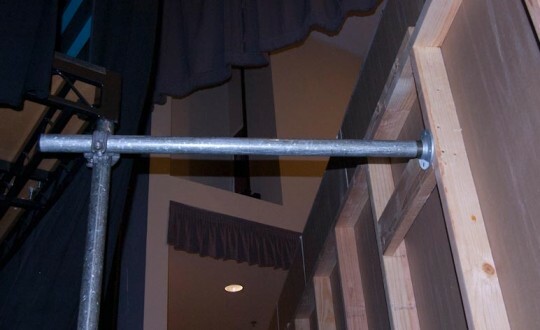 Large L-brackets secure the 2x4 to the back wall, and they’re toe-screwed in for good measure. 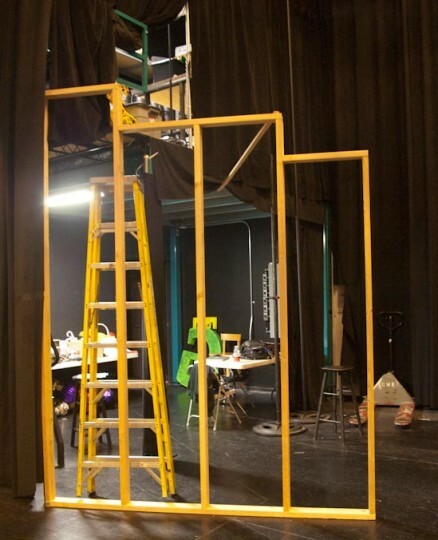 We also used floor flanges, pipes and cheeseborooughs to anchor the top of the screen to the truss. It’s rock-solid and not moving at all. The video appears to float mid-air. All three set pieces looked great.In the end, I think we created better looking set pieces in less time for less money than last year. Best of all, when the set came down, we unscrewed all the 2x4s (we screwed rather than nailed them together) and will use all the lumber to build shelving up in a storage room. The two walls came down in under 30 minutes and after some vacuuming and mopping, you can’t tell they were there. We’ll definitely do this again next year.